Explore los lugares más destacados de Ocho Ríos durante este recorrido de 7 horas desde Montego Bay y Grand Palladium. Suba hasta la cima de las cataratas del río Dunn, una de las atracciones naturales más famosas de Jamaica, con una parada en Columbus Park por el camino. Disfrute de un tradicional y delicioso jerk jamaicano en el restaurante Scotchies Outdoor Garden Restaurant (no incluido en el precio) y pase algún tiempo paseando por las calles de Ocho Ríos en busca de recuerdos. El traslado de ida y vuelta desde Grand Palladium y Montego Bay está incluido. My husband and I just completed this tour and absolutely enjoyed the Falls. Majestic! When I first looked at them I was thinking no way was I going to make it up, but the guides and the technique in which they guided you up the falls was no less than expert. We both made it up and was very proud and excited. You can get whatever you need from this area. After finishing the falls, there is a section that you can get your souvenirs which is great. One stop shop. This is a must do!!! 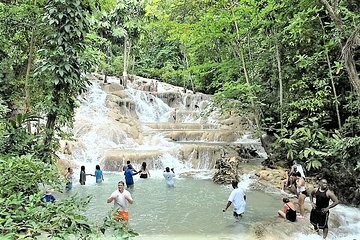 Dunns River Falls was lovely, just not enough time there to enjoy it. Once we were dropped off we only had 2 hours before the driver was back to pick us up. This 2 hours was only enough time to climb the falls but nothing else, didn't get chance to take any photographs ourselves. Then on for the shopping tour - don't bother getting off the bus unless you wish to be hassled. They take you to what we thought was a shopping centre, NO it is only 2 shops, one side is a touristy shop for your bits and pieces and the other side is for diamonds etc.... - sorry but not my kind of shopping, I like to browse in more than one shop. This was amazing. Everyone was very helpful as they took us up the falls.